Contemporary with Gehry's Guggenheim Museum in Bilbao, The Vontz Center in Cincinnati, Ohio reveals Gehry's affinity for swooping sculptural forms as well his ability to create interesting shapes with traditional materials, in this case brick. Finished in prefabricated masonry panels, the volumetric nature of the building seems exaggerated by the clear delineation that the bricks give the seemingly inflated volumes. With a construction cost of $46 million, this building is among the most expensive in the University of Cincinnati's "Signature Architect" program, which includes works by Peter Eisenman, Michael Graves and Henry Cobb. This program helped reshape the urban campus throughout the 90's, and helped raise design awareness in the city (helping bring other architects such as Zaha Hadid to Cincinnati for major projects). 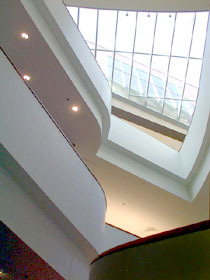 The Vontz Center consists of three occupied floors (containing offices and laboratories) and has walkable interstitial space above each floor. 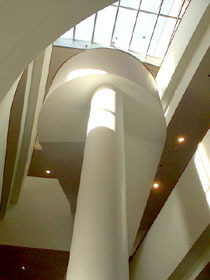 Oversized multistory windows protrude from the building's sculptural forms, giving the massive shapes a sense of permanence and rigidity, which plays well with the more whimsical and rotund shapes that dominate the building. It's these very windows, however, that proved to be a bit of a challenge for those working in the Vontz Center's office spaces. Within months of moving into the building, office workers used large pieces of paper, cloth and in some cases tarp to cover the sun from shining in through the large windows. Perhaps due to the aesthetic issues presented by such attempts at comfortable working conditions by the workers, or by their requests, the large windows are now fitted with large adjustable screens. These screens and are reminiscent of those that were used in Peter Eisenman's Wexner Center, in order to keep the harmful sun out of gallery spaces. Though much was made by Cincinnati residents and university students of this building as well as the others in the Signature Architect program (due to their cost and appearance), the Vontz Center¹s seemingly bowing walls and playful shapes seem to have struck a chord with locals. Over time, the building has come to be appreciated by the UC staff and student body, unlike the Peter Eisenman building just down the street. 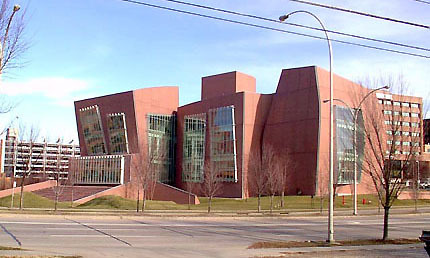 Some have thought of the building as Gehry's homage to the city's past, having once been named Porkopolis. It has been said that the building was originally intended to be finished in a reflective surface, much like Gehry's Guggenheim Museum, but due to cost brick had to be used. If this is true, it may very well have been a happy accident, since the curvature of the walls is further accented by the bricks, and the more familiar material with its inherent color seem to have pleased the local population. 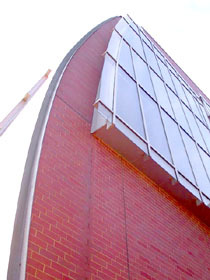 The use of brick also ties the building in nicely with surrounding medical buildings in this portion of the campus, which are almost all finished in similar brick. 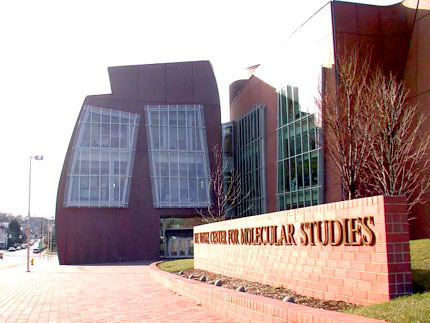 The Vontz Center for Molecular Studies is located in the eastern portion of the University of Cincinnati's campus, in the northwest corner of Martin Luther King Drive and Eden Avenue. The campus is in the Clifton/Correyville neighborhood of Cincinnati. Street parking (metered) is available in the blocks surrounding the building. 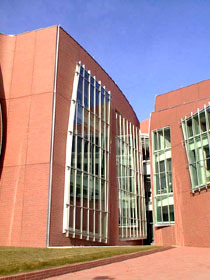 The Vontz Center is located only three (long) city blocks away from Peter Eisenman's Aronoff Center, on the opposite side of the street (MLK Drive). The building is open Monday through Fridays 8-5, though laboratories are closed to the public. To arrange a tour of the building including the labs, email public.relations@uc.edu. More information is available at the Center's website http://vontz.uc.edu (note no 'www'). General information can also be obtained at the university's main number +1 513 556 6000. Very well reviewed at amazon.com.